Arimura Kasumi to star in a new movie "Little Maestra"
Actress Arimura Kasumi (18) will be starring in a new movie titled 'Little Maestra'. �This is Arimura's third time appearing in a movie, and her second time taking lead role after her previous movie, 'Gal Basara ~Sengoku Jidai wa Kengai Desu~'. 'Little Maestra' follows the story of a high school girl who is a�genius�conductor, who tries to rally an orchestra at a fishing�village that is suffering from underpopulation. The filming for the movie started on January 27th in Shika, Ishikawa prefecture. Currently, Arimura is exerting herself for the filming in prolonged snowstorm.�She commented, "It's more like painful than cold, so I'm having hard time speaking my lines. �My skin also got all crusty because of the dryness." 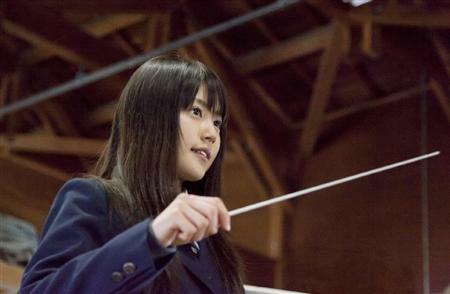 For the movie, Arimura received a two-month lesson for the role of the�conductor. It seems like this role requires a lot of hard work, as the actress said, "It's so difficult, since I have to use the nerves up to my fingertips." Arimura's co-stars will be Shaku Yumiko (33) and EXILE's MATSU (36), and the movie is scheduled to be released in this fall. LITE announces new mini-album, "past,present,future"